Picture it. Easter Sunday. Late afternoon. Dusk is falling, the dogwoods trees our being bathed in a beautiful evening glow outside and I am pretty sure everyone is exhausted from a fun, yet relaxing family day. My cousin, Peanut, and I are sharing our fourth afternoon nap of the day. Easter was almost over and I was on the couch, dozing joyfully at the fact that I had fully escaped any "lets dress the dogs up for Easter" shenanigans. 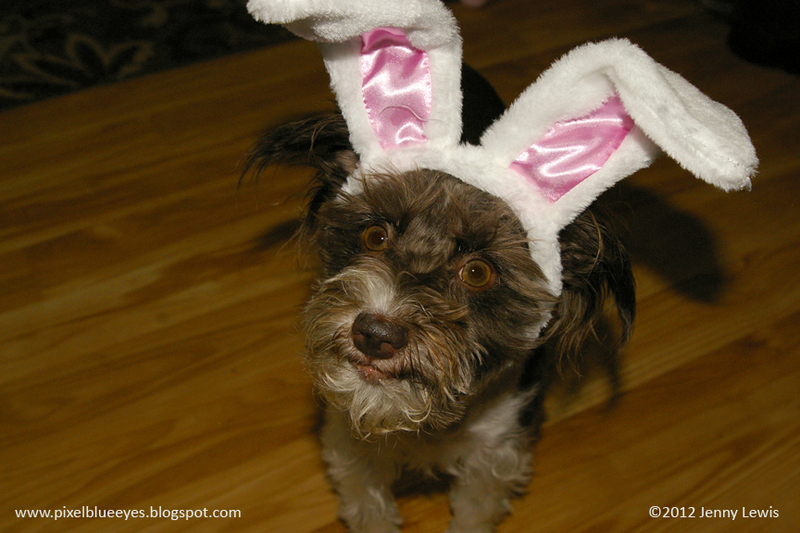 Peanut had had a previous adventure with dressing up as the Easter Bunny earlier in the weekend (click here to read that hilarious account), but that was long gone now and I had made it through unscathed. Suddenly I heard giggles and whispers coming from my Mommy and Auntie. I opened my eyes just long enough to see a flash of white and pink go over my head...then a bright flash of light. REALLY? SERIOUSLY?? I lay super still, hoping to appear uninteresting and making myself become 'dead weight' so that maybe they'd leave me be. But no. Peanut was a victim too. Peanut apparently thought she could talk our way out of this, and starting explaining to Auntie that she had already done this earlier in the weekend and that we should instead focus on our evening snack making. She also tried to tell them that I was completely exhausted from running outside during playtime and wrestling with the cats all day. I appreciated her efforts. It did not work...Flash, flash of the light. Apparently, there is a shutter bug epidemic going around in my family, because everyone had a camera. Even the cameras were getting in the way of the cameras! Peanut tried to look like she was asleep, and I gave the look like I was completely bored out of my mind. They just kept taking photos. More camera flashes every few seconds, one after another. Finally, Peanut and I realized there wasn't much we could do but try to get through it. After all, our Mommy's don't ask for much. So why not choose to give this joy to our family and be good little pups? So, we both started looking at the camera and being cute bunnies for them. After about a hundred thousand more photos, Peanut and I jumped off the couch. I went up to Mommy and asked her why she likes to do stuff like this sometimes, and she said, "Well, sweetie, you have your moments of loving to be mischievous with me. And I have moments of being mischievous with you!" I completely understood it after that. Then she asked, in her little Mommy way, "Now, will you give your Mommy one of those famous Pixel smiles...please?" "Of course Mommy!! Anything for you because I LOVE YOU!!!" Happy Mischief Monday friends!! I am part of the Mischief Monday blog hop. 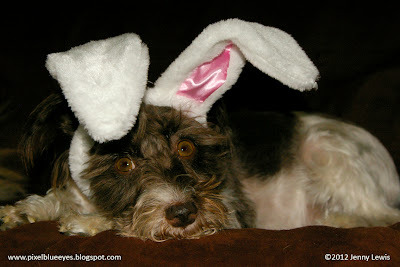 Please visit my friends blogs and see what kinds of mischief they have been up to this Easter weekend. I hope you will visit and LIKE my Facebook page at www.facebook.com/pixelblueeyes. OMG! 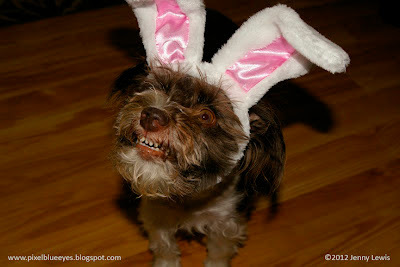 Those pictures are hilarious but that last one of you, Pixel is the best! LOL! pixel, you look adorable as a bunny =D and peanut is such a cutie too ! 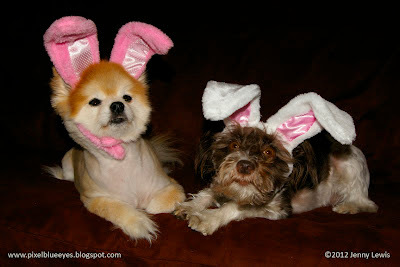 Hi Pixel, the peeps think it's hilarious putting us in bunny ears.....*sigh*..... but what can you do???? They dish out the treats. Hoping you anti-docking campaign is going well!! You and Peanut are the cutest bunnies. I love all your blogs Pixel!! Awww Pixel! Mom makes me do the weirdest things too but it makes her so happy I just do them...why not...usually there is a treat somewhere at the end of the projects and a happy mom is a good thing! So very cute babies. Grammy is very proud of you. Wow! Look at those adorable Easter bunnies! Thank you so much for your sweet comments on my bloggie. Please keep me in your thoughts -- I get my test results tomorrow!